CoLab is a design tool that provides information on the use of design representations (sketches, drawings, models and prototypes) by engineering designers and industrial designers during New Product Development (NPD). There is no set way to use CoLab; it facilitates understanding and collaboration by giving a name, example and description for the key design representations and identifies the differences in how they are used by engineering designers and industrial designers. Grey cards provide information on design stages, types of information and have a taxonomy of 35 design representations that is common to both engineering designers and industrial designers. Blue cards provide specific information on the use of design representations by engineering designers and red cards on the use of design representations by industrial designers. A key role of CoLab is to facilitate understanding of how engineering designers and industrial designers use design representations in different ways. Identifies that the card is from one of the four stages of NPD (concept design, design development, embodiment design or detail design). 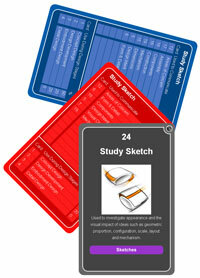 The cards next to it indicate which design representations are most commonly used during each of these stages, with use by engineering designers on the blue card and use by industrial designers on the red card. Identifies the categories of design representations as being from either ‘sketches’, ‘drawings’, ‘models’, or ‘prototypes’. Green identifies that the card shows types of design information and yellow identifies that the card shows types of technical information. The cards next to it indicate which design representations are used to communicating the specific type of design or technical information, with use by engineering designers on the blue card and industrial designers on the red card. Copyright © 2011 CoLab. All Rights Reserved.